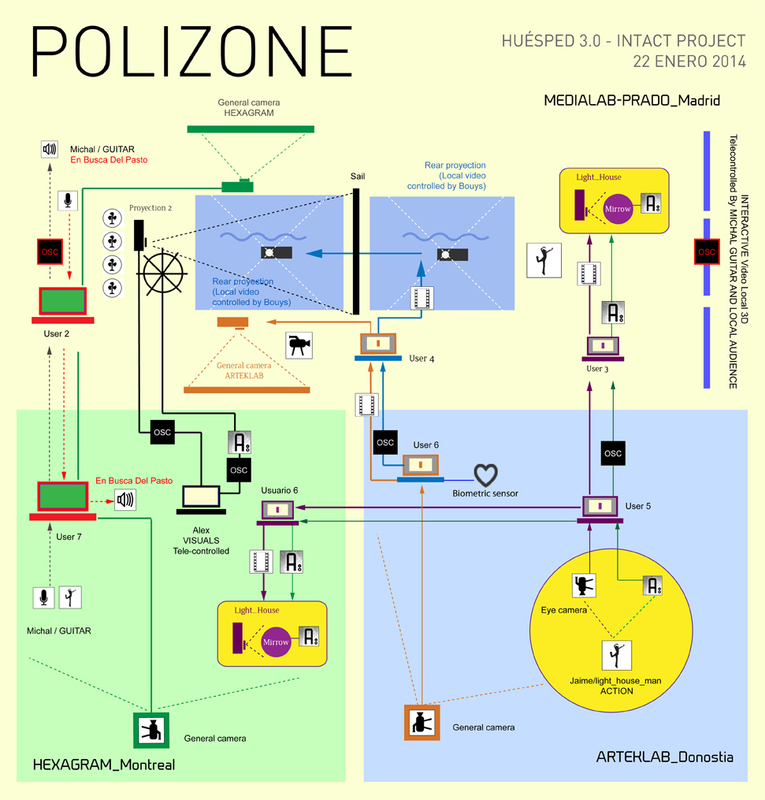 Polizone – 3ª fase de Huésped – Intact Project from INTACT on Vimeo. HUÉSPED is a an initiative from INTACT and it is defined as an innovation project in the arts and telecommunications field. It is an independent and self-funded project. It counts on the contribution of artists in Europe (Spain and France) and Northamerica (Canada) . These artists’ participation is translated into the programming of interactive interfaces, the elaboration of a theory of the art of telecommunications, and the testing of new tools. Everything is developed through a staged process which is performed in a collaborative, on-line and distance way. Development of 3ºphase at MediaLab Prado with the collaboration of Huésped Group (Madrid node). On January 22nd, at 7.00PM (Spain time), an action of artistic telepresence will be held between three centers of Arts and New Technologies: MediaLab Prado (Madrid), Arteleku (Donostia) and Matralab (Montreal). It is a multidisciplinary work, developed in the context of an interactive installation, that proposes a telematic trip through cyberspace, with sensored and robotic elements, and the creation of visuals, sounds, music and performance. This new experience will be the third and final phase of Huésped, an INTACT Project’s initiative, that will bring together the developments of the previous phases (Huésped 1.0 and Huésped 2.0) and will add some new elements that, up until now, had not been applied to the tele shared action. The facility setup installed in Medialab will be triggered by the act of a performance which will be “manned” by the audience (those present will contribute to the speed of the boat trip) and “tele-directed” by remote nodes in Arteleku and Matralab. This time, we will pay special attention to the content and the dramaturgy, which we call “vertical”. The purpose of this work is to lay the foundations for a participatory, immersive and interactive telepresence on three levels. Dicen que cuando crece la marea, los paraguas son de gran utilidad. Por el paseo marítimo flotan los transeúntes granizados por la espuma del mar. Cuando los hombres se montaron a lomo de las olas y sus redes, tres hermanos se repartieron las corrientes. Hubo una tempestad. Las mareas reordenaron la corteza de las cosas simples. Y una tripulación a la deriva tomó las riendas de una embarcación inspirada por el caos. Ahora somos una barca encantada por un conjuro tecnológico. De piratas y fantasmas. La sinfonía de las mareas proviene del fondo. El lecho donde se redactan los sortilegios que golpean el casco de este navío desquiciado. La morada de los navegantes tiene forma de mujer. Emerge, se expande y abre su traje al mar. Flota mientras espera al viento. Está quieta pero se mueve, llevando a sus tripulantes entre grietas y pasajes submarinos. Allí, en la cabina de su nave, ella tiene su trono de poder y profundidad. Su corazón se divide hacia dos puertos que la invocan, pero ella permanecerá activamente inmóvil. Su viaje interior sugestionará sus nervios, desquiciando los ejes de su tiempo. La travesía de signos remotos extiende la mirada y se abre paso entre los puertos. Y en el puerto más alto está el ojo del farero, hipnotizando su barca. Lo que ella no sabe es que el farero ha sugestionado a la marea con una llamada. Yo la quería como a la caracola que habita en mi corazón de fuego subterráneo. Amaba a su barca, abriendo la trama del mar. A ella, que nunca se subió a un andamio. ¡Ven, y te mostraré la espalda de la gran ola! Su vela abre un pasaje de tiempo que se hincha con el viento circular. INTACT directed by Sara Malinarich and technical direction by Manuel Terán. Conceptual development in collaboration with Jorge Ruiz Abánades and the peformative work in collaboration with María D. Alba. This production thanks the collaboration of the Huesped telepresence group of Medialab-Prado: Alberto Rivero, Caroline Groueix, Abraham Manzanares, Whoun, Javier Perez Aranda, Daniel Pinheiro, Marta Llorente Pascual. In Canada: Matralab (Montreal) 12:00h (local time). With the participation of Michal Seta, Alexandre Berthier. With the collaboration of Frend Tremblay and Nicolas Bouillot.